June 24th - July 19th. Summer Math Camp is an extension of the Classic Math School Program. Thus, the same educational philosophy and techniques apply (see Classic Math School Educational Philosophy). 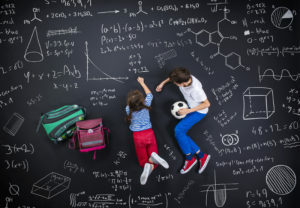 Meeting most parents needs, we provide half-day and full-day programs by creating a unique well-balanced Math-centered curriculum with Math, English, Science, and Art. All of the classes permit students to work at a challenging pace, to explore topics in depth, and to study subjects and develop skills that students their age often do not have the opportunity to pursue. Summer programs gives them a better picture of their own academic abilities and potential, help them to develop better work and study habits, and refine their educational goals. In this regard, all courses enhance and broaden the students overall educational experiences and sharpen their academic skills. The courses cover a great deal of material and place emphasis on active learning and putting knowledge to use in independent and creative ways. The student to teacher ratio in classes is very low, allowing considerable opportunities for individualized instruction and attention. Our instructors have expertise and degrees in their disciplines and come from a variety of professional backgrounds and educational settings. Algebra II and Geometry Crash courses are intended for students planning to take the same courses at their regular school next school year. Crash courses cover the most important topics, critical for overall school year academic success. Crash courses can be taken separately or combined with the SAT I Prep class. Four weeks enrollment is required for either the crash course or the SAT I prep class. * Waived if tuition paid in full before June 1st. ** Four-week enrollment is recommended. Admission priority will be given to four-week applicants. 20% OFF for the second child from the same family. $100 nonrefundable deposit required if tuition is not paid in full at the time of application.